Riding a motorcycle is one of the most exciting ways to commute. Unfortunately, that thrill comes with inherent risks. A 2009 study review published in Accident Analysis & Prevention found that motorcycle riders are 34 times more at risk of dying in accidents than drivers of passenger cars. The authors of that study point out that the reason so many riders die in crashes is simple: They weren’t wearing helmets. More recently, the National Highway Traffic Safety Administration estimated that motorbike helmets saved up to 1,630 lives in 2013 – and could have rescued another 715 crash victims had they been properly utilized. If you were injured in a motorcycle accident in Kentucky, you may be entitled to compensation for medical expenses, lost income and noneconomic damages. Contact the Troutman Law Office to discuss your case. Matt Troutman is an accident attorney in Louisville who will interview witnesses, gather evidence, and help you pursue the maximum settlement. If your case goes to trial, Mr. Troutman has the litigation experience and resources to represent your interests in court. Call to schedule a free case evaluation. What Does the Law Say about Wearing a Helmet while Driving a Motorcycle in Kentucky? Statistics show that riding a motorcycle without a properly fitted, well-maintained helmet is risky, and that for your own wellbeing, it is advisable that you practice safe driving habits at all times. Kentucky state law allows motorcyclists to choose whether or not to wear a helmet – with certain crucial provisions. The Kentucky Transportation Department’s Motorcycle Manual states that drivers over the age of 21, who have adequate insurance and have been licensed for at least one year, are not legally obligated to wear a helmet. Anyone younger than 21, or who has held their license for less than 12 months, must wear a helmet at all times when operating a motorcycle. 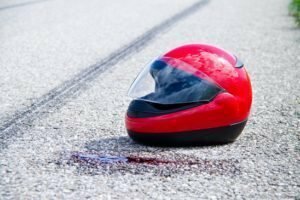 Can I Claim Damages after an Accident in Kentucky If I Wasn’t Wearing a Helmet? If you were injured due to a negligent driver while riding a motorcycle in Kentucky, then you can make an injury claim even if you were not wearing a helmet. This is because the at-fault driver’s liability has nothing to do with your use of a helmet. However, this would only apply if you were over the age of 21 and in possession of a license for longer than a year. And the cost of your injuries or loss. 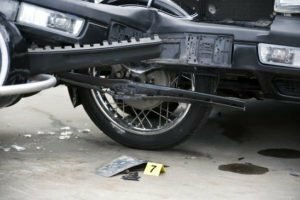 Were you injured in a motorcycle crash that another driver caused? Contact an experienced accident attorney from the Troutman Law Office to discuss your legal options. Matt Troutman is an accident attorney in Kentucky who will help you avoid mistakes during the claims process such as signing a general release, accepting a low settlement, or unknowingly admitting fault to insurance adjusters. Call to schedule a free case evaluation with a Louisville personal-injury lawyer.